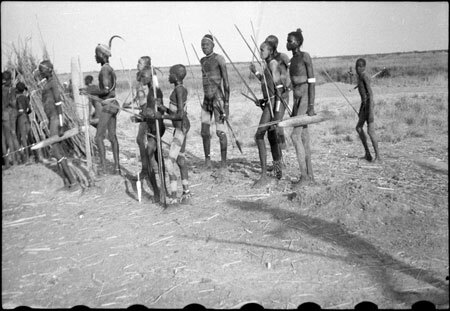 Youths carrying spears and ambatch shields on the fringe of a dry season cattle camp dance, two wearing thiau armrings on their left arm, several with ash body decoration. Morton, Chris. "Nuer dancing" Southern Sudan Project (in development). 03 Jan. 2006. Pitt Rivers Museum. <http://southernsudan.prm.ox.ac.uk/details/2004.130.32942.1/>.